With legendary Jeep® 4×4 capability to take you off the beaten path and strength to tow or haul your toys wherever you need them, the All-New Jeep Gladiator won’t just carry you to the adventure, it’ll be a part of it. 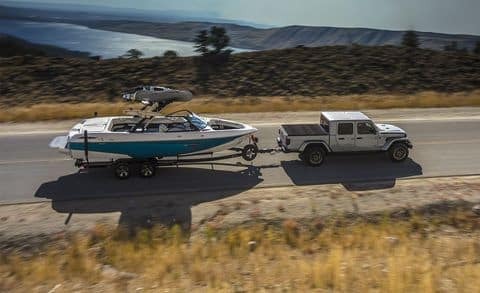 The All-New Jeep® Gladiator has been engineered to deliver Best-in-Class towing of up to 7,650 pounds, which is 150 more pounds of towing than the Ford Ranger, and almost 800 more pounds than the Toyota Tacoma. The 5-foot truck bed is constructed of high-strength steel and includes four heavy-duty tie downs and lighting inside the box. So whether you’re pulling a camper, a boat to the lake or a trailer with loaded ATVs, you can count on it to make the adventure happen. 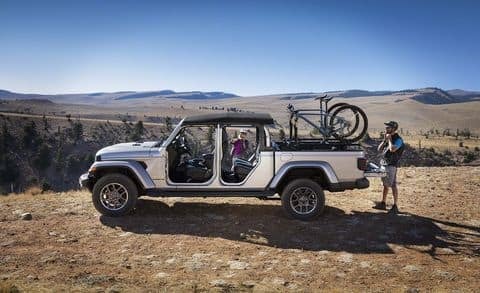 The All-New Jeep® Gladiator rises above with a Best-in-Class payload of up to 1,600 pounds, 100 pounds for than the Nissan Frontier. 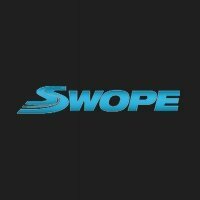 Add in versatile truck bed features like a three-position tailgate, an available roll-up tonneau cover and an available 115-volt power outlet, and hauling your gear has never been more convenient. 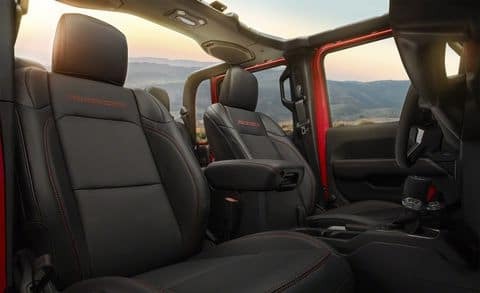 Polished details and intuitive functionality are impressively combined in the interior of the the All-New Jeep® Gladiator. Features like an available Largest-in-Class 8.4-inch touchscreen on the Uconnect 4C NAV with Apple Car Play support and Android Auto integration, an available Industry-Exclusive removable Bluetooth wireless speaker and available leather-trimmed seats put the Gladiator in a class of its own. In addition, innovative storage solutions add convenience wherever you go.